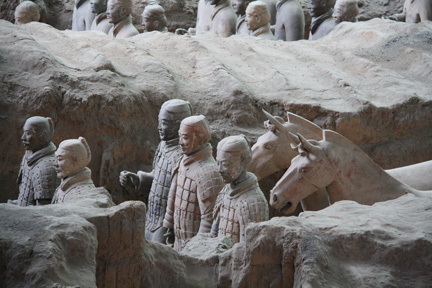 The Terra Cotta Army of warriors and horses is a magnificent archeological excavation of the 20th century. It is a collection of terracotta sculptures representing the armies of Qin Shi Huang, the first Emperor of China. It is a form of funerary art buried with the emperor in 210-209 BC and whose intention was to help guard his empire in his life after death. Terra Cotta Army is a clay army of more than 8,000 life-size terra cotta figures of soldiers and horses discovered in 1974 in Xi'an, Shaanxi province, China after they were buried underground for more than 2200 years. The figures, dating from 3rd century BC, were discovered in 1974 by some local farmers in Lintong District, Xi'an, Shaanxi province, near the Mausoleum of the First Qin Emperor. Xi'an and the Museum of Qin Terra Cotta Army have become milestones on all travelers' itinerary. It is a continuing archeological project that is certainly one of the most memorable portion of any trip to China. The Terra Cotta Army is now regarded as the Eighth Wonder of the World. The mausoleum of Qin Shi Huang is the largest preserved one in China. It is a unique architectural assembly whose layout exhibits the urban plan of the capital, Xianyang, where the imperial palace is enclosed by the walls of the city, themselves encircled by other walls. The mausoleum is also associated with an event of universal significance: the first coming together of the Chinese territory in a centralized state created by an emperor, in 221 BC. 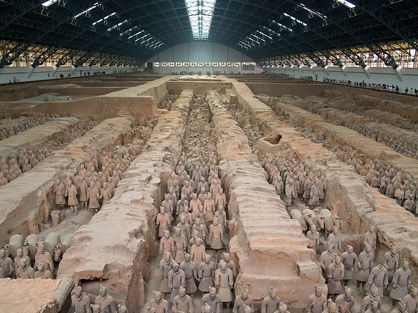 By current estimates, in the three pits containing the Terra Cotta Warriors and Horses, there were over 8,000 soldiers, 130 chariots with 520 horses and 150 cavalry horses, the majority of which are still buried in the pits. There are four main pits associated with the terracotta army. These pits are located about 1.5 km east of the burial mound and are about 7 meters deep. Pit one (230 metres long and 62 metres wide) is the largest of all the pits. It has 11 corridors that are paved with small bricks and have a wooden ceiling. It contains a veritable army of 1,087 warriors, the infantry and cavalry corps standing in battle formation with archers protecting the flanks. It is estimated that there are a potential 6,000 statues of warriors and horses in that one pit alone. It is now entirely enclosed by the site museum. Pit two has similar items as Pit one, about 1,500 warriors, carts, and horses in cavalry and infantry units and is thought to represent a military guard. Pit three is the command post, with approximately 68 high ranking officers, dignitaries, and a war chariot. Pit four is empty, seemingly left unfinished by its builders. The sculptures of terra cotta warriors are life-sized. They vary in height, uniform and hairstyle in accordance with rank. These figures include warriors, chariots, horses, officials, acrobats, strongmen, and musicians. The figures vary in height, according to their roles, for example, the tallest being the generals. Originally most held real weapons such as spears, swords, or crossbows. The figures were also originally painted with bright pigments, variously colored in pink, red, green, blue, black, brown, white and lilac. The colored lacquer finish, individual facial features, and actual weapons used in producing these figures created a realistic appearance. Weapons such as swords, spears, battle-axe, scimitars, shields, crossbows and arrowheads were found at the pits of the terra cotta warriors. A large number of other pits have also been excavated which may lie within or outside the walls surrounding the tomb mound. These accessory pits variously contain bronze carriages, terracotta figures of entertainers such as acrobats and strongmen, officials, stone armor suits, burials sites of horses, rare animals, and laborers, as well as bronze cranes and ducks in an underground park.